1. Homework questions. Students could ask three questions about homework, then we turned it in (grammar). 2. Wordskills. Students learned three new word parts: iso, macro, and micro. 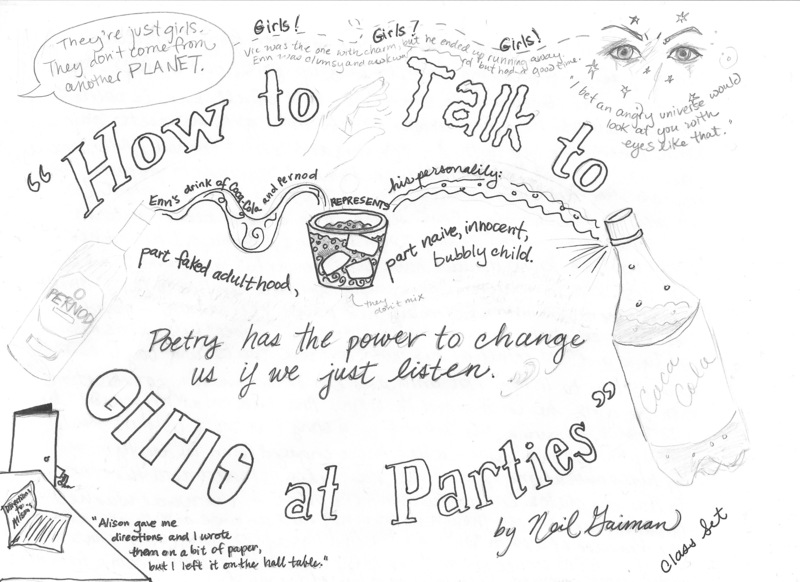 The narrator of “How to Talk to Girls at Parties” introduces himself as not knowing how to pick up girls, but in fact he makes a better date than Vic [topic sentence proving an opinion or observation–not a fact]. Enn contrasts completely Vic’s “use it then lose it” approach to dating in which he acts like he owns Stella then runs from her. [Point of support one] First of all, Enn is polite — even chivalrous. [Elaboration number one] Enn offers drinks to all three girls he meets. Additionally, when Wain’s Wain refuses to dance to avoid “damage to property,” Enn respects her decision instead of pressing the issue, like Vic might (3). [Support 2] To add to his chivalry, Enn seems to be a good kisser, since he equates emotion with kissing. [Elaboration 2] When Triolet first kisses Enn, she simply “presse[s] her lips to [his],” and Enn is unsatisfied (6). Later, moved to emotion by her poem, Enn “kisse[s] her properly” (6). [Support 3] Enn’s kissing ability is a direct result of his most coveted trait as a boyfriend: his ability to listen. Enn is deeply moved by his conversations, proving he has truly listened and therefore values his dates. [Elaboration 3] Enn understands the poem — “the words washed through me” — and thinks about “the measure of [the] poem” through the last line of the story (6, 7). Vic doesn’t even bother to listen; he thought it was “a foreign exchange thing” (4). [Conclusion stating the significance of your argument] Enn’s boyfriend-material qualities seduce not only the girls, but alos the reader, creating in his audience a greater appreciation for the smart, quiet boys of the world–not the Vics. 4. Work time. Students finished reading their story and then began their one-pager. HW: Finish Poe story, questions, and one-pager for Monday. Absentees: Turn in your grammar HW on Monday. Get vocab notes from a friend. Download the one-pager instructions and complete the one-pager on your Poe story. Finish Poe story and questions and one-pager for Monday. The one-pager will count as a quiz grade. Questions: Regular – it’s on the packet or Honors – pick up the questions in the classroom. The love of your life has great teeth… I mean, really great teeth. Teeth. Teeth. Teeth.